Garlic contains several components beneficial for heart and circulation, as well as immune health to fight infections. Alliin is an odourless sulfur-containing chemical derived from the amino acid cysteine. 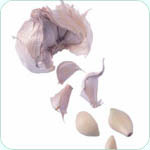 When garlic bulbs are crushed, alliin is converted into another compound called allicin. Allicin appears to be at least one of the primary active compounds that gives garlic its characteristic odour and many of its health benefits. Garlic's allicin appears to have infection-fighting action as well as potential cardiovascular effects including, possibly, the ability to lower blood pressure and cholesterol. Allicin is further broken down to a compound called ajoene, which may be the substance that inhibits blockage in blood vessels from clots and atherosclerosis. Garlic & Heart Health: Garlic has been hailed for its anti-cholesterol beneficial effects A number of studies have found that garlic reduces elevated total cholesterol levels more effectively than placebo. Garlic may also be beneficial for risk factors for heart disease, including high blood pressure, and diabetes. Garlic & Circulatory/Vascular Health: Garlic supports the overall health of the circulatory and vascular system. Garlic has an anti-coagulant action which inhibits platelet stickiness (aggregation) and increases fibrinolysis, which results in a slowing of blood coagulation. Garlic may help lower homocysteine levels. Homocysteine, similar to cholesterol, can contribute to increasing amounts of blood clots and plaque in blood vessels, which block healthy blood circulation. Garlic & The Common Cold: A well-designed study of nearly 150 people supports the value of garlic for preventing and treating the common cold. In this study, people received either garlic supplements or placebo for 12 weeks during "cold season" (between the months of November and February). Those who received the garlic had significantly fewer colds than those who received placebo. Plus, when faced with a cold, the symptoms lasted a much shorter time in those receiving garlic compared to those receiving placebo.